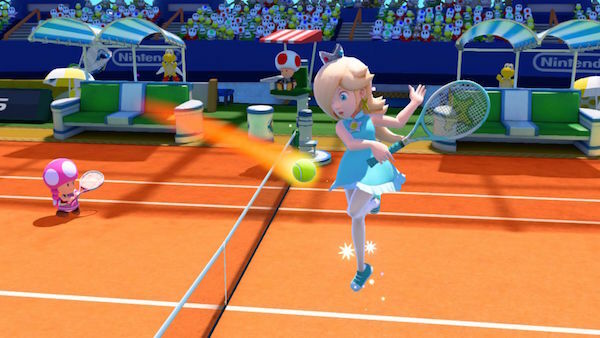 ario Tennis titles usually fall into one of two camps – heck all Mario Sports titles in general can be thought of in this way. They either lean in to the quirky Mario side of things filling the world with oddities and weird power-ups, or they add a Nintendo veneer to a more serious experience. 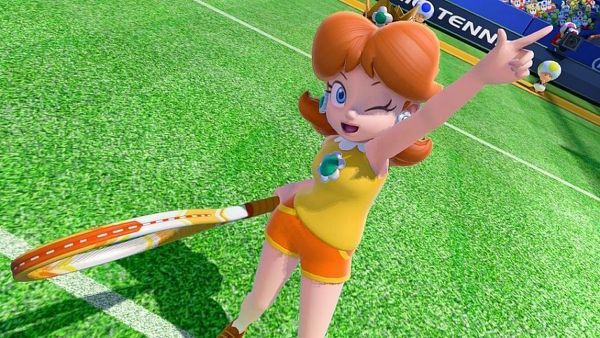 Mario Tennis: Ultra Smash sits firmly in the first camp filling the game with bright animation, visual oddities, wacky courts, explosive power-plays and mushroom power-ups. At the very core of the game is a tried, tested and very solid set of mechanics that serve (pun intended!) up a more than reasonable tennis experience. Nintendo have been getting this right since the days of the N64. Moving your chosen character (Yoshi obviously… why would you play anyone else?) with the left stick, or D-Pad, you can navigate the varying court surfaces with ease (Clay, Grass, Cement, Carpet (!?!) etc). Using the A,B, X and Y buttons will perform different types of shot. Slices, smashes etc. X will pick a “best fit” shot for you to execute if you’re a novice player or playing with young children. It works pretty well most of the time and at least makes you feel like you know what you’re doing out there on the court. As well as the standard shot combination you also have a dive button on the RT. You can also combine buttons, for example B and A, to perform more complicated shots like a drop-shot. As well as these standard shots you can also perform special shots. A coloured circle will appear on the ground, simply run over to it and perform the button combination it requires and you will perform a special. For example holding down Y will perform a powerful short shot that will hit the court close to the net and fly high over the opponent’s head. These specials, when places carefully, are very difficult to counter. 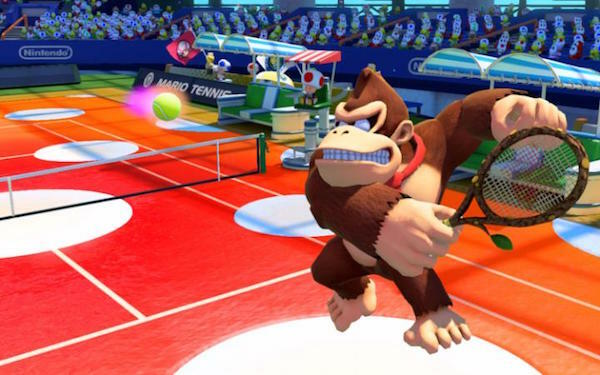 These shots are only available in certain modes of play but do manage to mix things up a little from the bog standard tennis (also another mode). Most of the time these are fun but they can feel a little frustrating when someone is using them against you constantly – especially after they’ve eaten a giant mushroom! Giant mushroom you say? Yes at random points large mushrooms are thrown on to the court. If you manage to pick one up then you will more than double in size. This means you can cover more court and perform more powerful versions of the standard shots. Again, over use of this can become frustrating at times. Talking of characters there are twelve characters available to you out of the gate (Mario, Luigi, Peach, Wario, Donkey Kong, Yoshi etc) and then four other unlockable characters. These characters are unlocked by performing certain in-game action like playing ten of a certain game type. There’s an in-game coin system that can be used to unlock some of the in-game milestones – of which there are twentyfive. These milestones often give you an item like a different court type etc. 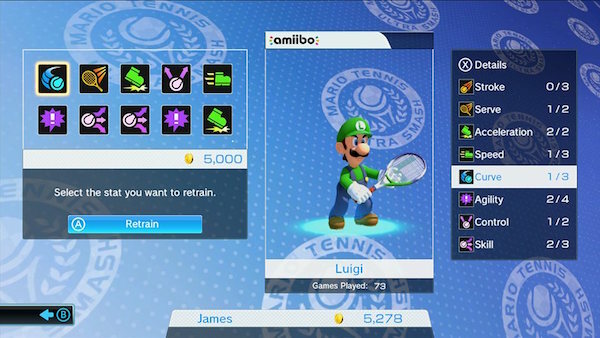 Coins are given after each match or mini-game. 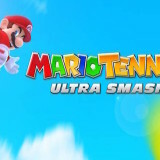 Talking of mini-games Mario Tennis: Ultra Smash has one… no you didn’t misread that. As an overall package the game feels incredibly sparse. The one mini-game is Mega Ball Rally. Simply put you choose an opponent and you try and keep a rally going for as long as possible. It’s distracting enough for short bursts but not exactly noteworthy. There is also no career mode of any sort. You have standard tennis (no powerups or special shots), Mega Battle (which are matches that use the new power-up mechanics). The final mode Knockout Challenge, is the closest you’ll get to an actual tournament mode. You literally take on each character from the game one by one as they get progressively harder. It’s a nice enough addition but it’s not a full match – you simply play a tiebreak game of first to 7 points. If someone has a mushroom and you don’t then it can be a tough slog on later difficulties. So, mode light, no stats, character light and mini-game light. Surely the online play and local play is the star of the show and saves the day… right? Well, almost.. kind of. The online play is reasonable and the matches I played worked pretty smoothly for the most part. A few dropped connections and stutters in game but that’s not unusual for online games at times so we can glance past that – unless it becomes the norm. Again the online mode, and local play, are hampered by a lack of modes and characters that all pretty much feel the same to play. It might say “Speed” or “All Rounder” on their charcter screen, but if there are differences, then they are miniscule. Finally there is the ability to add in Amibos and train them up. This adds a little to the bundle, but once again there’s just not a massive amount of things to do with them once you’ve imported them. 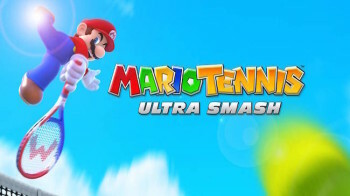 Mario Tennis: Ultra Smash isn’t a bad game. It’s also not a smash hit either (it’s like I’m courting these puns!). What we have on offer feels like two thirds of a complete game. It has the gorgeously colourful look of the modern Wii U era Nintendo/Mario titles. It has the sounds and music too. It just lacks any real depth or reason to keep playing it long term. It feels like Nintendo on autopilot. As it stands Mario Tennis: Ultra Smash is a solid tennis game, that looks good and plays well. It’ll delight the kids with it’s bright visuals and accessible play – it might not keep them engaged for as long as perhaps it really should have. With a £40/$50 price tag you expect a little more for you money. This would have made a solid £20 downloadable distraction. Online play is available but due to Nintendo’s online limitations communication is not supported so considerably safer than other devices.